Sinterklaas is weer in 't land ... Hier in de intocht in Utrecht. 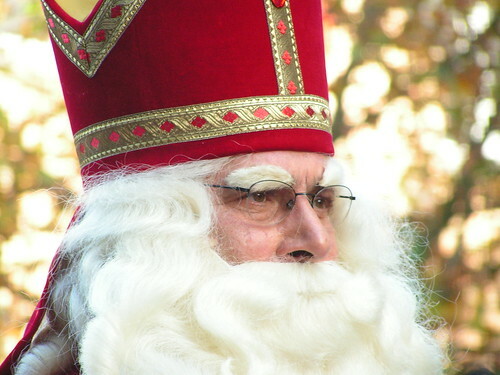 Sinterklaas is back in the Netherlands again. This is NOT Santa Claus although there is a relation (no coincidence the names are similar). This guy has got his own holiday on December 6th. Somewhere in november (today) he arrives from Spain in a steamboat. He rides a white horse called Amerigo, and he is accompagnied by black guys in colorful suits (Zwarte Pieten - Black Petes) who help him put presents in the chidrens' shoes.